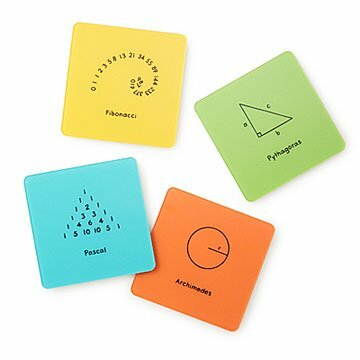 Celebrate math's greatest hits while you sip with this set of four coasters featuring famous equations. For number lovers, nothing's quite as beautiful as the infinite digits of Pi...except maybe a nice pour of old vine Zin or a tall glass of seltzer. Celebrate math's greatest hits while you sip with scientist-designer Rovena Tey's set of four coasters. Each one features famous equations, from Fibonacci's spiral of "Golden" numbers (familiar to Da Vinci Code fans) to Pascal's brain-teasing triangle (a sort of old school Sudoku). Cork backings prevent slips and scratches on your table, and also offer short summaries of the theories showcased on the coaster. Great for STEM teachers, dorm room number crunchers, and slide rule-loving hostesses. Made in Toronto, Canada. Although formally educated as a scientist, Rovena Tey has always been creative. Since she was a little girl, she learned art as an intuitive, hands-on activity. She proves that "creative scientist" isn't an oxymoron, making fun science- and math-inspired gifts for the inner nerd in all of us. Driven by her curiosity about the everyday, her background in molecular biology, and her passion for creative expression, her scientific art is a unique way of sharing her love of the field with the world. She always starts with a bit of scientific wonder and thoroughly researches it before picking up pen and paper to translate it into art. I wasn't able to be at Ashley's bridal shower but someone made a video of her opening my gift. It got a great reaction from everyone! It was the hit gift of the party! I thought it was the perfect gift for a college math major who works with numbers every day.